Be sure to aware the following guldellnes when uslng your headset. 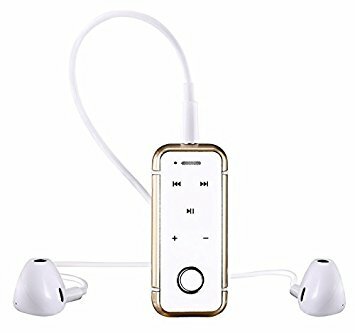 11.The headset should not be stored or use at temperatures below -15 C (5 F) or above 550 (131 F) it may shorten battery life. Please check the USB charging cable is original or not before charging the Bluetooth headset. Warning: Must use original charging cable to charge for the Bluetooth headset, otherwise it may damage the Bluetooth headset. Charging: This headset uses a non detachable built-in Li-Polymer rechargeable battery. 1. Before charging, make sure the headset has been switched off. 2. Plug USB cable into the charging jack of headset plug other side of USB charging cable into the USB charger or other charging device. Charging will start and the red light remains bright on the headset. 3. The headset takes approximately 2 hours for fully charged, blue light remains bright or red light switch off after charging completed. 1. Keep distance of the headset and mobile phone within 1 meter, the closer, the better. 1.Switch on your Bluetooth headset, ensure the headset entered to pairing mode, blue lights remains bright. 4 Switch on the headset again, ensure the headset entered to pairing mode, blue light remains bright. 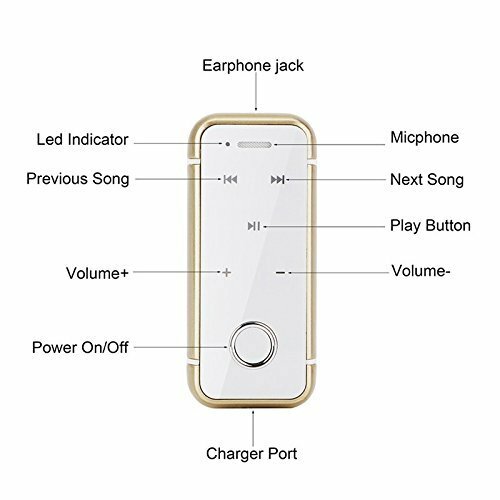 5 Switch on Bluetooth search function of mobile phone 2, the mobile phone will display the Select then complete pairing. Switch off the headset: Or Switch off the Bluetooth function of your mobile. 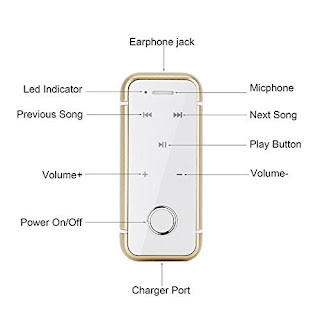 Reconnect the paired headset with the mobile phone. 1 Keep distance of the headset and mobile phone within 1 meter. 2 Keep press the "MF Button" until the blue light blinks, the headset will automatically reconnect with your mobile phone. Press the "MF Button" once to answer the call: Or Use your mobile phone to answer the call. Press the "MF Button" once to drop your call; or Use your mobile phone to drop your call. Keep press the "MF Button" around 2 seconds to reject your call: Or Use your mobile phone to reject your call. Double press the "MF Button". If there is another incoming call while you are answering incoming call 1. press the "MF Button" once to drop the incoming call 1, and press the "MF Button" again to answer the incoming call 2. If there is another incoming call while you are answering incoming call 1, keep press the "MF Button" for around 2 seconds, then release, to keep the incoming call 1 and answer incoming call 2. If you are answering incoming call 2, want to change to incoming call 1, can keep press the "MF Button" for around 2 seconds, then release, you can switch back to incoming call 1. Press the Play Button once to pause the music; press the Play Button again to resume the music. Press the Next Track Button or Previous Track Button once to select previous song or next song. Volume control Press the Vol Button or the Vol(-) Button to adjust volume while calling or music is playing through the headset. Technical specifications are subject to change without notice, we apologize for any inconvenience.